This story starts innocuously enough. I called Chase to cancel my British AirwaysVisa card. I explained my situation and the agent told me I couldn’t have my annual fee waived. I asked to have the card cancelled and then inquired if there are any other Chase cards with a smart chip (I almost starved in Denmark last year because everyone took chip and pin cards, but no one took swipe and sign cards). I asked about Freedom, Sapphire, Continental, and United cards and they do not have chip versions. The agent suggested the Palladium card as a smart chip card I could have. I said I was intrigued and she emailed me an application that I needed to return by fax (strange I thought, but I’ve never gone through the phone channel for a new card). The application was like any other credit card application and has the standard disclosures and legal writing. 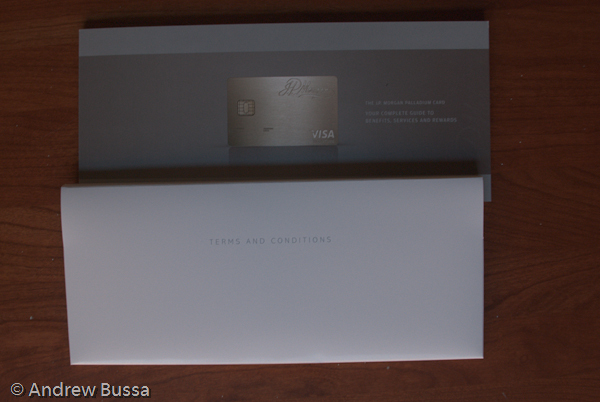 Unlike other applications, there was very little detail about the card benefits. This line did jump off the page, “Receive 35,000 bonus points when you spend $100,000 annually and make another purchase within that year,” as did the $595 annual fee. I looked for more details, but could not find a page about it on chase.com or jpmorgan.com. To find out what this card is, I had to apply. The application faxed, I sat around for a letter saying I was rejected. I didn’t want to ruin a shot at a Sapphire card and 50,000 bonus points, but this mysterious card seemed too good to pass up. When checking my accounts online, I saw a new credit card on my page. I was approved! The next day UPS delivered an overnight box. I opened it to find the best card presentation ever. 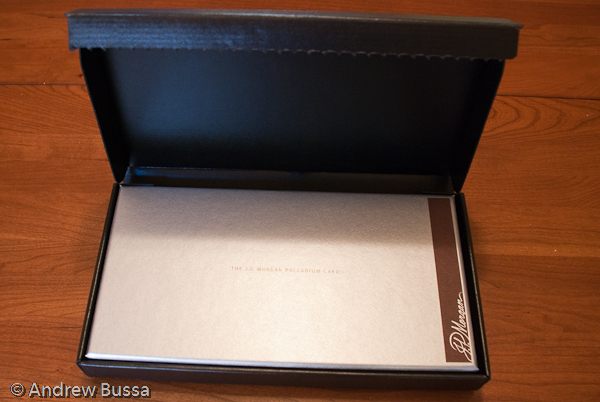 The card arrived in a silver JP Morgan box with a tan felt liner. It is very impressive. The card is the focal point when you lift off the lid. Under the card is the glossy benefits guide and all the paperwork, neatly packed in a folder. 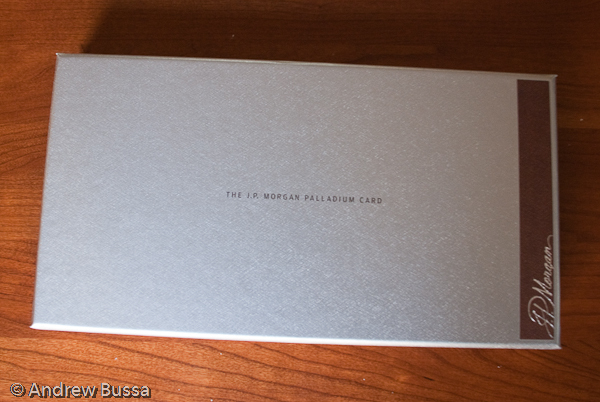 The JP Morgan Palladium Card is the same size as a normal credit card, but metal. Not just any metal, 23kt gold and palladium (Pd, number 46 on the periodic table). It is rigid and much heavier than expected. The card information is laser etched on the front and the signature is etched on the back (it arrives activated since the signature is on it). 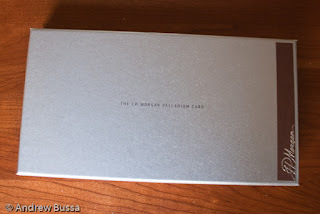 The JP Morgan signature on the front and customer service numbers on the back are engraved in the card. The card feels impressive and special and is made for the holder to feel the same way. The card comes with a Priority Pass membership (good guide to PP). There is no lounge copay and guests are free up to the lounge limit. Prepare for some irony coming up. American Express uses Priority Pass for their lounge access benefits too. Chase controls United (well most of their debt and can buy miles for their cards in advance to ease liquidity issues, or not and create leverage) and didn’t want Amex customers receiving lounge benefits at United. So now all Priority Pass United Clubs come with this message, “Note: Members holding a Priority Pass Select membership card and Priority Pass cardholders in the U.S. that receive their membership through a U.S. financial institution will not be allowed access to this Lounge.” So in Chase’s efforts to block Amex, Chase’s top customers are hit in the cross fire. I didn’t find this out until after my card arrived and I am extremely upset that I can’t go into a United Airlines lounge (I rationalized the fee by subtracting out the cost of a United Club membership and I almost exclusively encounter United Clubs in my domestic travels). I called to request a Priority Pass card, but have not received it yet. The guide claims that “We are able to provide you with a virtually limitless array of unique offers, time-saving conveniences and personalized insider expertise.” I haven’t found a situation to put them to the test, but it sounds like a fun challenge to see what impossible dinner reservations they can make for me. They also provide travel planning services, ticket procurement, travel assistance, and airline, hotel, car, and cruise reservations. I am really excited about this benefit and how far reaching it goes. The guide book spends 10 pages on Ultimate Rewards, about 8 too many. The JP Morgan Palladium card Ultimate Rewards site is the same as the Chase Sapphire card and allows 1:1 point transfers to United, Continental, Southwest, and British Airways along with a $.01 per point cash option and merchandise rewards. The JP Morgan Palladium earns 2 points per dollar on travel spend and 1 point everywhere else. There is no sign up bonus, but if you spend $100,000 annually, you get 35,000 bonus points. If you are in it for points, get the Sapphire card. I don’t think airline miles are worth much thought to the target audience because of the next benefit. First time Marquis Jet Card purchasers get an extra hour free when paying with their JP Morgan Palladium card. On the cheapest card (Embraer Phenom 300 maybe? ), this is worth $4,636; an amazing benefit that I can’t use unless someone else comes up with the $116,000 for the other 25 hours. Unsure what private aviation solution is best for you? The card also offers a private aviation consultation. "A Marquis Jet executive will begin to understand your travel needs and learn when and where you fly to help you select the best private aviation solution for you. If you are unsure about your needs, we will help you to select the NetJets aircraft type that will provide you with maximum flexibility." Using the card and booking through the J.P. Morgan Concierge service can bring some benefits similar to what top tier status brings. These benefits differ by property. This is another benefit I look forward to exploring. The card (like many other cards) comes with many different insurance benefits when traveling. There is a few pages of fine print on these, but at a high level the card provides: primary rental car coverage, roadside assistance, emergency evacuation, $1,000 for repatriation of the cardholder’s remains, supplemental medical and dental coverage, travel accident insurance, trip interruption insurance, trip delay insurance, baggage delay coverage, lost luggage reimbursement, and hotel burglary (forced entry) insurance. If you have any questions or want more detail on these, please leave a comment with your question. I you find something on sale within 90 days of buying it with the Palladium card, you can be refunded the difference. This feature is capped at $1,500 a year and the fine print refers you to other fine print, so it might not be as simple as you would like. Also, as with most cards, the card holder in not responsible for unauthorized purchases. 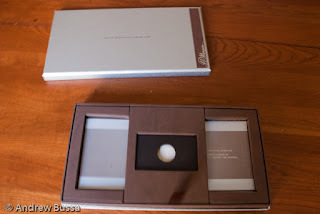 The target JP Morgan Palladium card customer is one with large balances with JP Morgan and Chase. JPM has your money and are making a fortune off you, so they have very few fees with the card so you feel special and not nickel and dimed. There are no foreign transaction fees, no cash advance fees, late fees, over-limit fees, return payment fees, or advance check fees. This card exists to build a stronger relationship with JP Morgan. Fees don’t further that goal. There is a $595 annual fee though, so not every fee is waived. Additional card members are $100. The “No Preset Spending Limit” does not let me walk into an Aston Martin dealer and leave with a DB9. My limit is three times my normal Chase card limit and purchases in excess of that will be evaluated before approval. I’m really excited to have this card and explore all the benefits. I just received it this week, so I can’t say if it is worth the $595 annual fee. Ask any questions you have in the comments section and I’ll try to answer them. After the Priority Pass membership worked in 2 out of 21 opportunities (a United Club card would have worked for 21 out of 21), I called to complain. The agent said I could buy a United Club annual membership and have it reimbursed. The usual policy is that only day passes are reimbursed, but I was able to have an exception. I need to remove my card to pass through metal detectors at airports. I tried going through with the card as the only metal on me and it set off the alarm. The TSA agent gave me a quizzical look when I said my credit card must have set it off. My card data has been stolen again. The Palladium card is a very high profile target and not difficult to copy or photograph. Chase has stopped all the fraudulent charges before they posted (except one which was promptly removed), but it's starting to get annoying to change my card on file with Hertz, Avis, United, Paypal, etc. I now use the lower profile (not low profile) plastic version when traveling. Same info as the metal card, just plastic with a smart chip. The Palladium team will send you one if you ask. Excellent stuff! Just curious... what's the ballpark credit score required and are they financial docs they require to prove income? They review the application on an individual basis but they expect a minimum credit score of 740. I wasn't asked to prove income and have a credit score that falls in the "Excellent" category. I do have an existing relationship with Chase, so they might have already known, or been able to guess, my income. I make considerably less than what I have read elsewhere as the income/net wealth requirements for the card. After a few months of use, the card mostly gives me piece of mind. Having the concierge service on call means I don't have to worry. 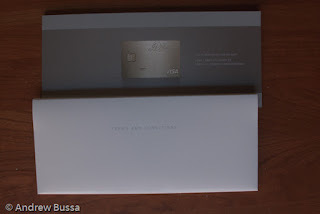 The Palladium card is not for people interested in earning big rewards quickly though. Roughly how many business days did it take for the card to show up on your online account after faxing the application? I recently applied and I am really anxious to know if I was approved or not. It took about a week to show up. I saw the new account on my Chase.com accounts page after about 4 days. Hope you like the card! Do you have a lot of money being managed by JP Morgan? I thought there was a requirement of using their private banking. The easiest way of getting the card is to become a member of the private bank, which requires a minimum balance of $200,000 under management. Do you still have a copy of the application? I am interested in seeing what is needed for the card. I do have a copy and it looks like the regular Chase paper application. My copy had some details filled in by my banker, so I can't share it. Sorry. Chase did pull my signature off the form to laser etch it on the card, pretty cool. There are no set requirements I've seen, so you can drop into a Chase and ask a banker (preferably senior, in the private client group, and knows you) to help. Good luck! Net worth isn't a prerequisite for the card; I don't have 7+ figure assets. It is a relationship building item, so you might need to start a relationship. Search for a private client office here: https://privateclient.chase.com/. Since it isn't offered to the public, nothing is guaranteed. Good luck! There is 0.3% Palladium and zero Gold in the card. I had an assay done on some expired cards. So much for the mythology! That's a bummer! I'd love to read the report too. 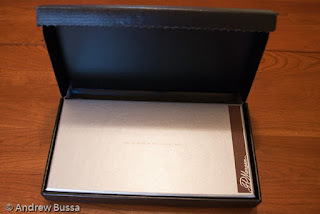 The Palladium card used to have a white gold belt around it but they removed it with the new design. There is no way that the whole card could be made of pure palladium, but the amount of palladium in the card is worth approximately $1,000. BTW - it is essentially stainless steel according to the analyst. I can send the entire breakdown of materials if anyone wants to see it. Just need to track down the old email. We just completed the assay. I am sorry but this is only a trace amount of palladium and not nearly enough to refine. If you would like them sent back to you please send a check for $5.95. to cover shipping. I've had this card ~3 years and had to change several times due to fraud (JP always took care of it, but huge hassle with my vendors) so I'm curious why your concluded the card is more susceptible? also, you travel with the plastic one, how does that lessen the fraud risk? It's the high profile nature of a metal card that gets it noticed. If an unscrupulous waiter were to steal card data, they're more likely go for the higher presumed credit limit; and the metal card advertises high limit. The plastic version doesn't stick out as much and rarely gets a second look. Since I started only letting the plastic one out of my possession, I haven't had any problems with fraud.